Vist our Post-perovskite page, too! Methane hydrate (MH), known as Burning Ice, is a special class of ice that contains methane molecules in cages or networks of hydrogen bonded water molecules. Low pressure phase of methane hydrate (MH-I) forms sI structure of cages. MH-I, abundant in the deep ocean, has been attracting attention of the industry as a key material of new energy resource, whose amount is estimated twice as much as the total fossil fuel reserve. MH is also known as an important material for understanding the mystery of the atmosphere of Titan, the largest satellite of Saturn. 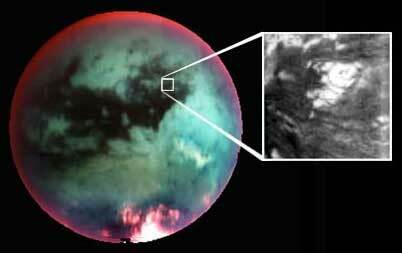 The conventional theory could not explain abundant methane gas in Titan's atmosphere because MH-I inside Titan was assumed to decompose into ice and methane around 1 or 2 GPa, and escape to the atmosphere to be photodecomposed in early stage of Titan's history. 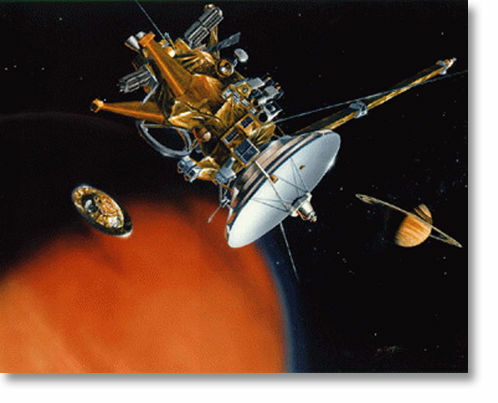 To understand this mystery is one of the goals of the Cassini-Huygens spacecraft, which started its journey in 1997 and will arrive at Saturn system in 2004}. On the earth, in 2001, Loveday et al. discovered new phases of MH by X-ray and neutron diffraction experiments under high pressure: MH-I transforms to MH-II ( sH cage structure) at 1 GPa, and then to MH-III phase (orthorhombic filled ice structure) at 2 GPa, which survives at least up to 10 GPa. Other researchers reported similar high pressure phases. Recently Hirai et al. reported that MH-III survives up to 42 GPa at room temperature. Shimizu et al. have measured the site- and pressure-dependence of CH- and OH-vibration frequencies in these phases up to 5.2 GPa. Discovery of these high pressure phases allows us a new explanation of abundant methane gas in Titan's atmosphere: methane gas may be reserved in thick layers of MH-III under Titan's surface and gradually emit to the atmosphere from the reservoir. In 1997 NASA and ESA launched Cassini-Huygens space craft for investigating the Titan's atomosphere, which will arrive at Titan in January 2005 and provide a large impact on the space materials science. Other types of hydrates are also important such as H2 hydrate for hydrogen strage, inert gas hydrates with simplest structure, and CO2 hydrate for preventing green house effects. 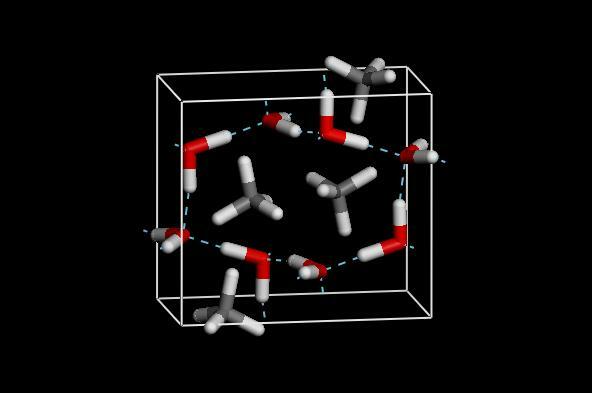 We are studying the physical properties of the newly discovered high pressure phases of methane hydrate by the first principles molecular dynamics simulations. J. S. LOVEDAY, R. J. NELMES, M. GUTHRIE, S. A. BELMONTE, D. R. ALLAN, D. D. KLUG, J. S. TSE and Y. P. HANDA, Stable methane hydrate above 2 GPa and the source of Titan's atmospheric methane, Nature 410, 661- 663(2001). J. S. Loveday, R. J. Nelmes, M. Guthrie, D. D. Klug, and J. S. Tse, Phys. Rev. Lett. 87, 215501 (2001). H.Hirai et al., Retention of filled ice structure of methane hydrate up to 42 GPa, Phys. Rev. B68, 172102 (2003). H.Shimizu et al., In situ observations of high-pressure phase transformations in a synthetic methane hydrate, J. Phys. Chem. B 106, 30 (2002). T.Ikeda and K.Terakura, Structural transformation of methane hydrate from cage clathrate to filled ice , J. Chem. Phys. 119, 6784 (2003). T. Kumazaki et al., Single-crystal growth of the high-pressure phase II of methane hydrate and its Raman scattering study, Chem. Phys. Lett. 3888, 18 (2004). Professor John Zarnecki, Open University:"There does seem to be a good chance that the surface is covered with lakes of hydrocarbons"
V.V. Struzhkin et al., Hydrogen Storage in Molecular Clathrates, Chemical Reviews 207, 4111 (2007). Lokshin et al, Structure and Dynamics of Hydrogen Molecules in the Novel Clathrate Hydrate by High Pressure Neutron Diffraction, Phys. Rev. Lett. 93, 125503 (2004). S. Patchkovskii and JS. Tse , Thermodynamic stability of hydrogen clathrates, PNAS | December 9, 2003 | vol. 100 | no. 25 | 14645-14650. National Methane Hydrate R&D Program (DOE) News Letter�@"Fire in the Ice"
T.Kume et al., High-Pressure Raman Study of Ba Doped Silicon Clathrate,Phys. Rev. Lett. 90, 155503 (2003). As Hard as a Diamond? A. San Miguel et al. , Phys. Rev. Lett. 83, 5290 (1999). Harder than a Diamond! X. Blase et al. , Phys. Rev. Lett. 92, 215505 (2004).